Vuda Point Marina, near Lautoka, Fiji offers all the cruising conveniences –affordably -- you’d expect in a pretty package. We were on our way out of Fiji, when we stopped at Vuda Marina. After a couple weeks in the Yasawas, we needed to refuel and refill our water tanks. We weren’t sure if we were going to do any more than that before anchoring for free (our usual preference) in some other convenient check-out spot. Ariel view, Vuda Marina, nabbed from their website. We held our breath sliding into the narrow, shallow but very well marked channel into Vuda Marina, I stressed over the tight C space there to tie off on for fueling and refilling water. 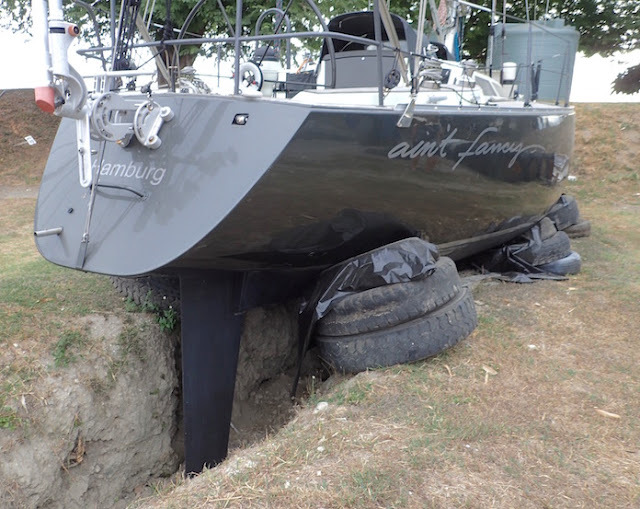 The slips were med-moored against a concrete circle enclosure, with little itty bitty docks making for exciting egress from our boat to the dock and back. Gliding in, Jenny from Plan C and her husband Rich waved us a welcome-in from what looked a little like a tree-house bar deck. Fueling was quick and easy. The marina was pretty, with clear, blue-green water and nice landscape touches. We were bowled over by the staff’s friendliness when we checked in, initially just committing for one night. We asked about how the country checkout worked, and were promptly alerted to some potential oops that could cause issues for us when the officials skipped some steps on check-in, unbeknownst to us. The staff figured out how to make it right. Marina restaurant, which makes an excellent cruiser gathering point. near Lautoka, Fiji. 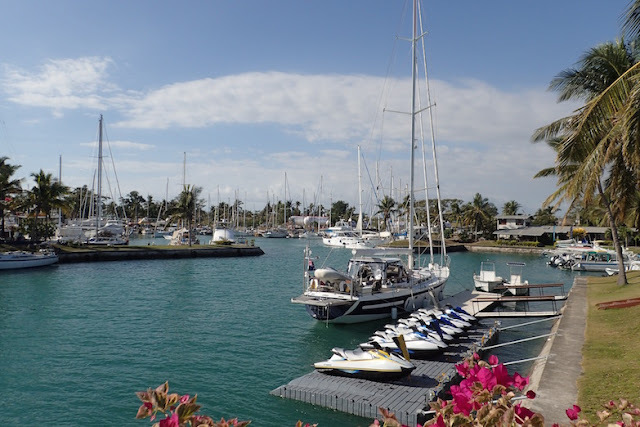 Plus, Vuda Marina staff was happy to convince all the checkout personnel required to take care of several of us departing cruisers at once, without ever having to leave the marina until we were ready to sail away. That sold us. Besides, at $0.37/foot/day, our daily cost was only a little over $13 USD. It wasn’t long that day before several boats followed us into Vuda Marina, filling it. Several were cruisers we knew and were delighted to reunite with, particularly Judy and Sherman of Fair Winds, Pam and Eric of Pied-a-Mer as well as Jenny and Rich of Plan C and Eve from Auntie. There was a nice restaurant, with half-price drinks on Thursdays happy hour, a great cruiser get-together spot. The wait staff prided themselves on greeting their customers by name (I noticed the bar register used a diagram which also captured the names of who sat where). hanging out together as couples. Vuda Point Marina, near Lautoka, Fiji. 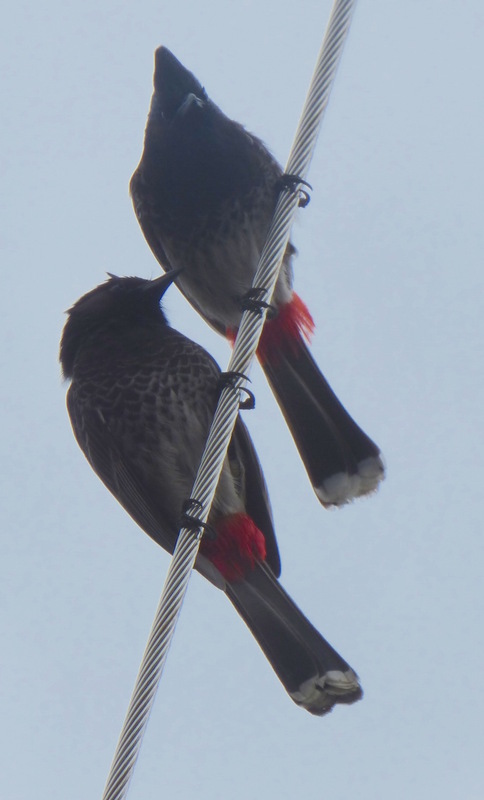 We wondered if it was courtship time as we saw these birds fighting and also hanging out together as couples. Vuda Point Marina, near Lautoka, Fiji. 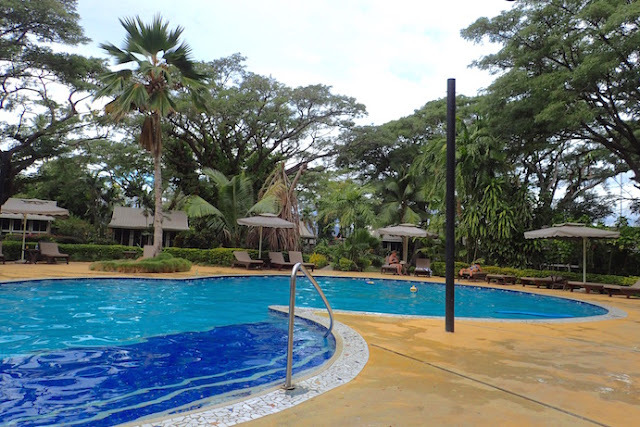 We also happily availed ourselves of Vuda Marina’s showers, book exchange and laundry service. Even the little general store offered a nice selection, stocking some gluten-free products. There were busses that stopped nearby taking passengers cheaply to Lautoka or Nadi, and several pleasantly assertive taxi drivers willing to more efficiently offer the same with great comfort and speed if you were willing to pony up. We shared a taxi to Lautoka for shopping (about a ½ hour away), and took the far less reliable, far more circuitous but much cheaper bus simply because we like to travel like and with locals. Lautoka’s market was quite good; not quite as robust as Suva’s, but about as good as Labasa’s. Like Labasa, there was a strong Indio-Fijian influence. Sherman raved about the affordability of the boat work he had last year in Vuda Marina, as was back for more again this year. 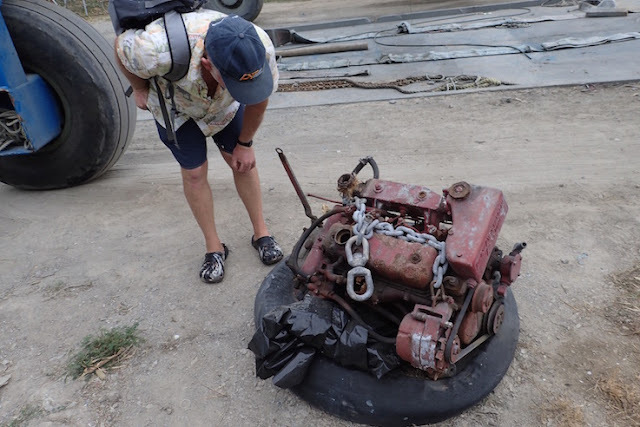 Savvy cruisers like him know to purchase all their materials* where they’re more affordable and readily available, then closely supervise the work. While we have no complaints about the quality of the work we had done in New Zealand, it certainly isn’t the most affordable place to get it done. * except Fijian teak, for those doing new woodwork, an affordable, quality option. No surprise, given Vuda Marina’s Nordstrom’s-like service approach, everyone on staff knew and greeted Sherman by name! The marina’s design ensured calm waters. Pits offered an attractive place for cruisers who wanted a cyclone-safe out of the water spot to secure their boats for later use. That same setup for security also seemed prevent breezes from circulating and cooling the sometimes swelteringly muggy air. The calm made it easier for no-see-ums and mosquitoes to travel with ease, though Florida’s Canaveral Point and its clouds of vicious no-see-ums takes the prize for that dubious honor in our books. Sherman tipped us off to cooling off at the resort next door. We could’ve walked a quarter mile out the marina, down the dusty road, then down the driveway into the resort next door. Instead we simply eased our way around the chain link fence between the two facilities and jutting over the shoreline, passing the “No Trespassing” sign posted on both sides of the fence. 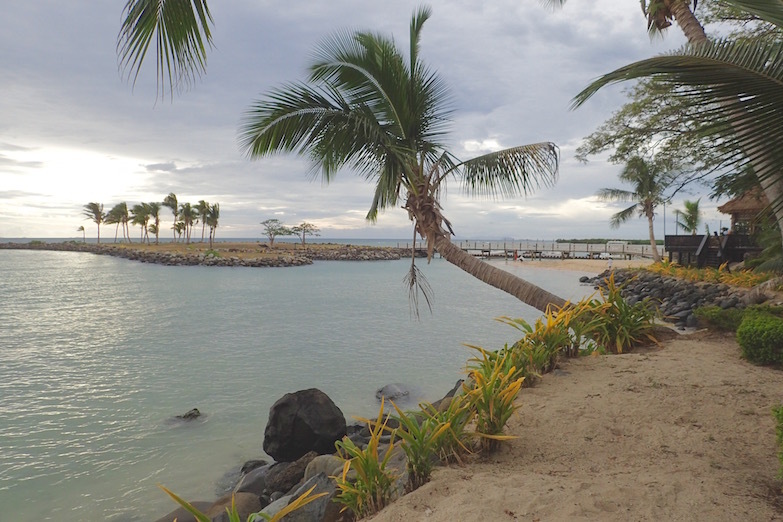 Vuda Point Marina is renown for its cyclone protection in Fiji. Here a boat sits comfortably in one of their pits, securely blocked in with tires. Vuda Point, near Lautoka, Fiji. It was like entering a whole ‘nuther ecosystem, or at least microclimate. The temperature was comfortable, a light breeze caressed us, and loungers around the pool had our names on them. Well, not really, but we claimed them as our own. In theory, there’s a day charge, but as we settled in with our drinks ordered from their bar, no one asked us to pay for any more than that. Meanwhile, back at Vuda Marina, the small, agile, flying cockroaches decided to get comfortable aboard. They were too quick and too many to keep out without resorting to chemical warfare. I hate roaches (and was amused by a pesticide website’s point-counter-point to the“roaches-aren’t-really-that-bad” about.com column). As soon as we could after we left Vuda Marina and were in a position to vacate and close up our boat (n Port Vila, Vanuatu), we gave it a good insecticide bombing with a fogger. That, followed up with some boric acid roach bait traps seems to have done the trick. Fortunately, our boat was less attractive than those in Vuda who needed to use rat traps to get rid of their undesirable Vuda Marina crew additions. When the time came for us to leave, we appreciated the convenience of the country checkout officials arranged by the marina. 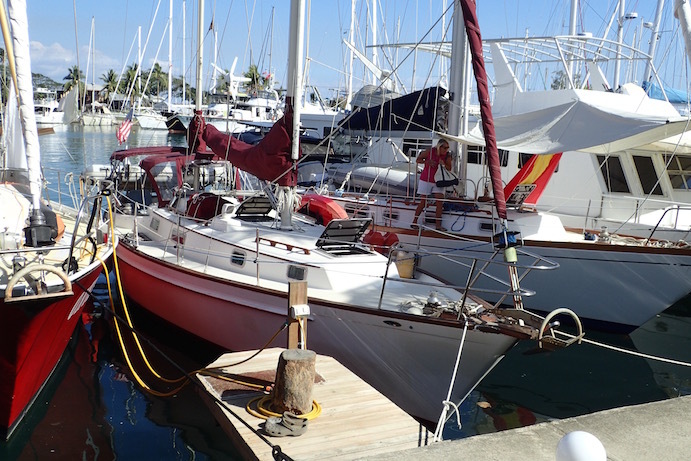 A Westerbeke 40, same engine as what we have in our Pearson 365 sailboat, appears to have made its final passage. Ours is running like a top these days. Vuda Point, near Lautoka, Fiji. More so, we were touched by Vuda Marina’s “Bula-bye;” several staffers who come by to bid you a musical fond farewell, with singing to a guitar accompaniment. As we sailed out of the marina, the same gals who helped straighten out our customs woes dashed out of the office to wave good-bye. How can such an incredible staff reside in a spot that’s worse than Green Cove Springs was for being a bit of a hell-hole? 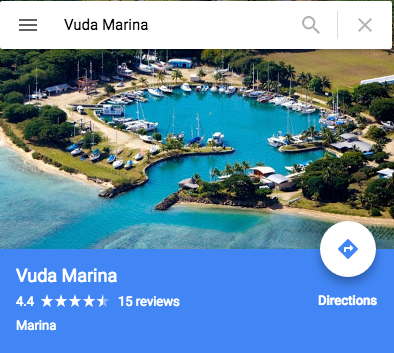 Nonetheless, it’s easy to understand why Vuda Marina is a place cruisers come back to for the exceptional service at a very affordable price. Just be sure to come equipped with good insect repellent and bug bombs (or, follow Frank of Next Adventure brilliantly lead, recruit some gekkos as crew), rat traps and a willingness to take time out for the more temperate oasis next door. Oh, and if you’re wiser than us, take your cue from Fair Winds; bring your materials and get your boat work done there, too. 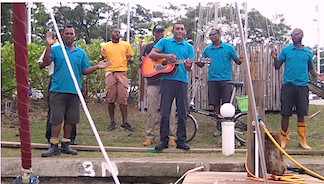 BulaBye is as sweet as a lullaby, when it’s sung by the wonderful staff at Vuda Point Marina upon departure. Vuda Point., Fiji. Lautoka and Nadi; closer to Lautoka. 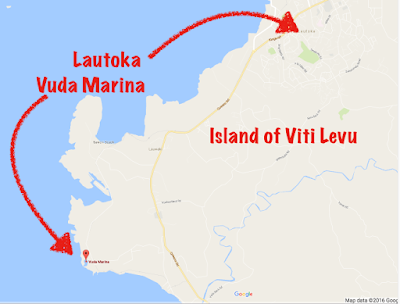 This is a relatively recent retrospective of our time in Vuda Marina (S17.40.820 E177.23.169), Fiji, from July 28 – August 1 2016. 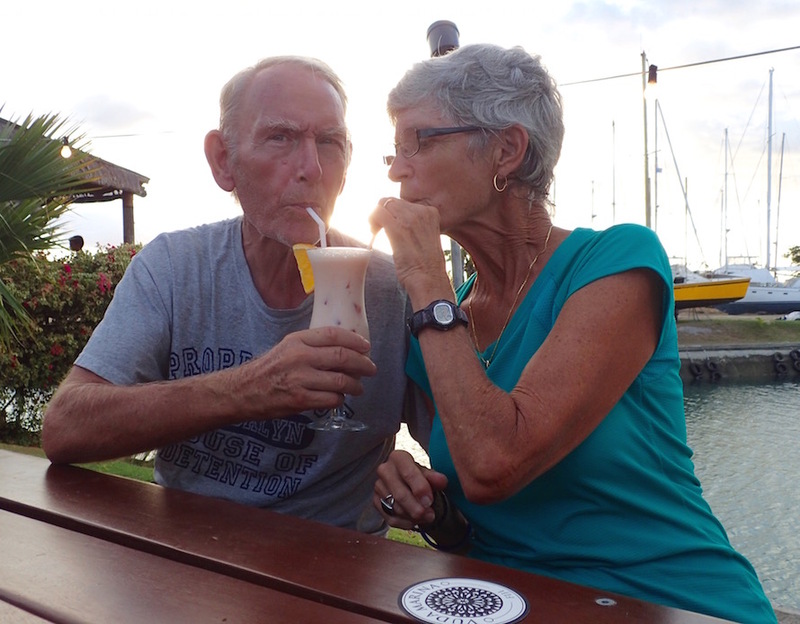 We are currently on a Yachting World mooring S17.44.750 E168.18.729) in Vanuatu’s Port Vila, getting ready for the next weather window to sail to New Caledonia. There’s still a few more Fiji posts to catch up on, a video of Vuda Marina’s “Bula Bye” to add as well as lots of Vanuatu posts to catch up on.